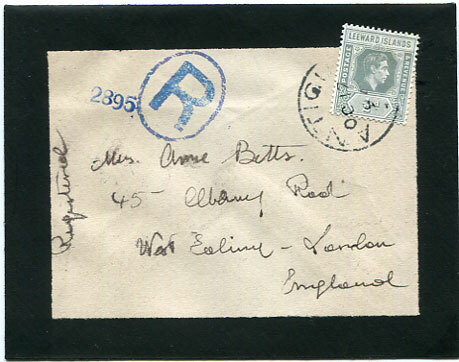 Bogus mourning cover to London with genuine Leewards 1949 KG6 ½d slate-grey tied forged 26mm ANTIGUA with fleuron at base cds dated OC 17 94 for 49 purporting to prepay the registered rate with blue "R" in oval appended "2895", reverse forged WEST EALING 11.45 PM 11 NOV 1938 arrival cds. 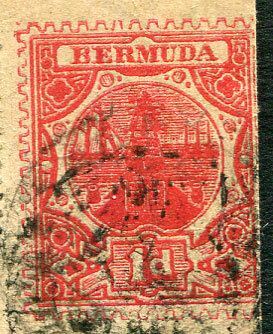 The genuine ANTIGUA fleuron at base measures 23½mm and was used period 1890 to 1901. 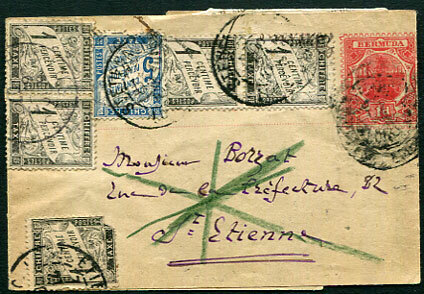 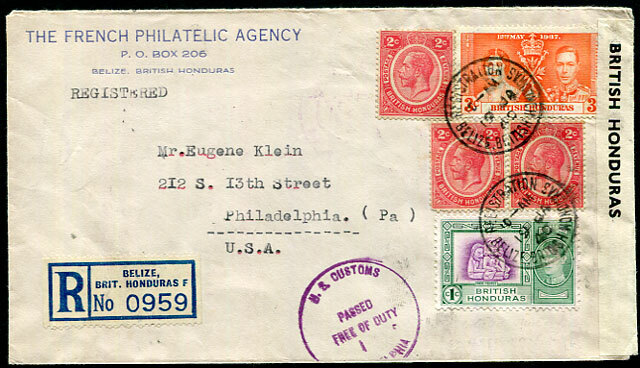 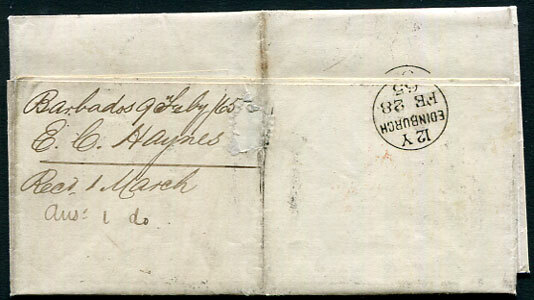 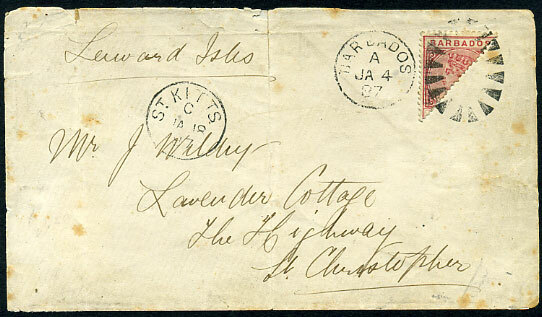 1908 1d red Dock design with simulated perforations printed on paper to resemble a newswrapper with purposeful indecipherable cancellation addressed St. Etienne, French postage dues from another cover added pmk’d St. Etienne 6-3 07. 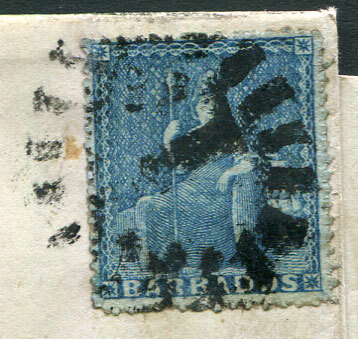 Fabricated 1865 entire to John Jeffrey & Co, Edinburgh with cleverly added (1d) blue tying in with original portion bootheel cancel with BARBADOS I/FE 9 65 cds alongside. 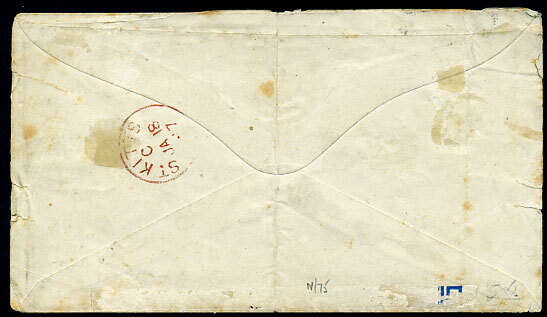 The entire only given away by addition of wrongly rated red crayon "6". 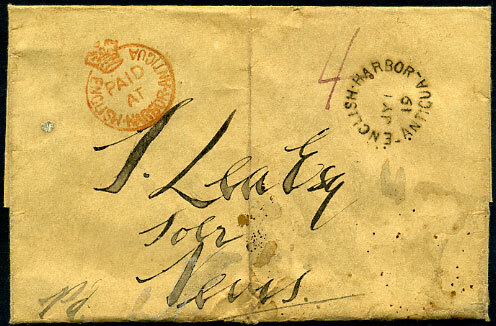 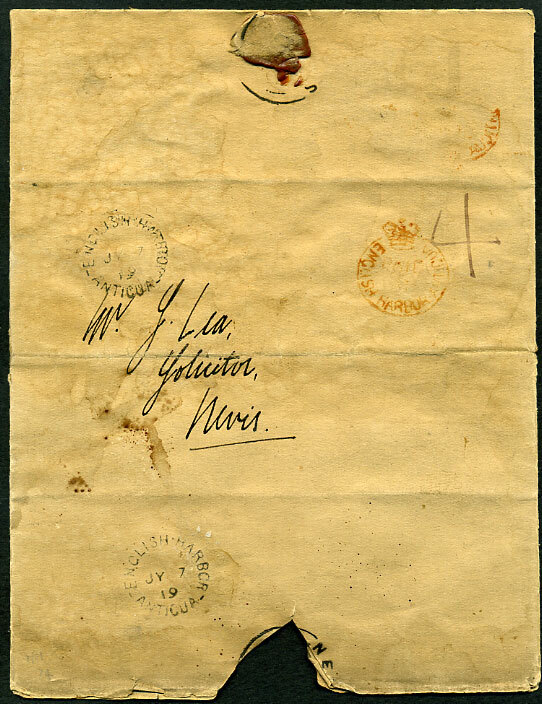 a completely fabricated wrapper (produced circa 1950) on brown parchment-like outer lettersheet addressed J. Lea Esq, Solicitor, Nevis with “Pd” lower left corner showing very fine red ink PAID AT ENGLISH HARBOR Crowned Circle plus very fine black ink ENGLISH HARBOR, ANTIGUA datestamp for JY 1 19 (19 for 61) and purplish ink “4” inter-island rate mark above address panel. 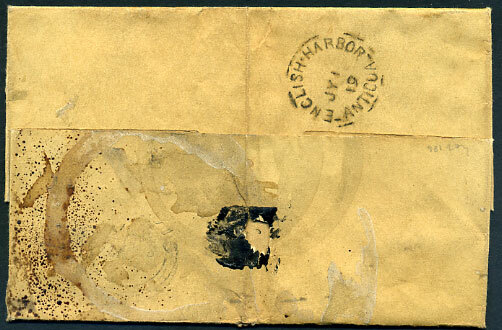 Lower flap with trace of NEVIS arrival dbl-arc and some circular stains which are the base of a candle holder which has been cunninglyly blown out to spatter tiny flecks of red wax, also some minor soiling added by use of a paint brush dipped in water. 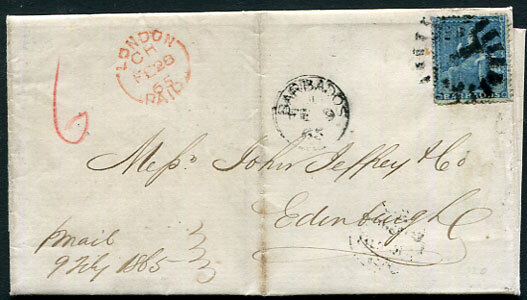 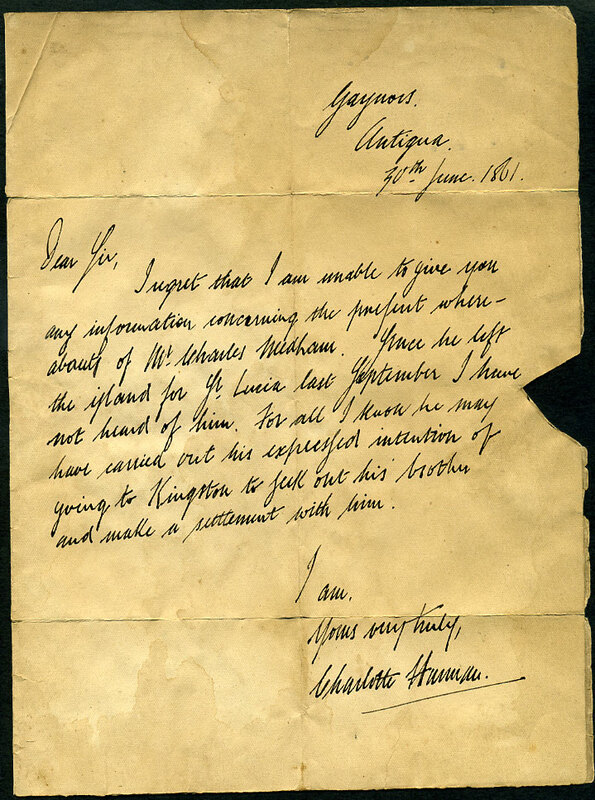 Only two genuine entires with this Crowned Circle (Cat.£9,000) are recorded. 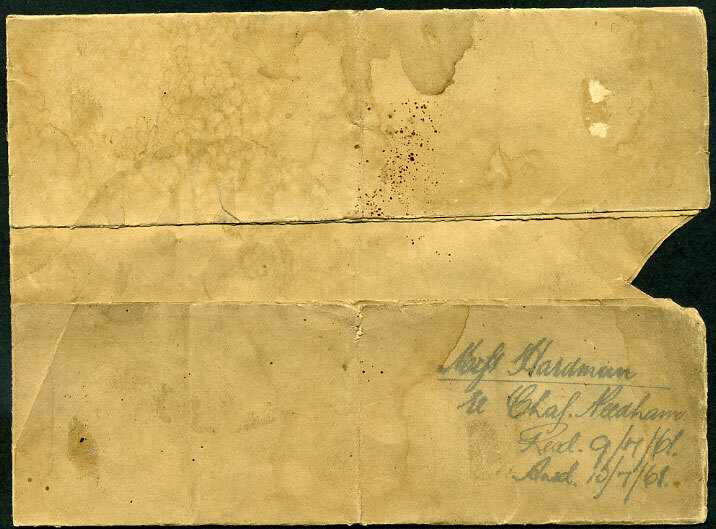 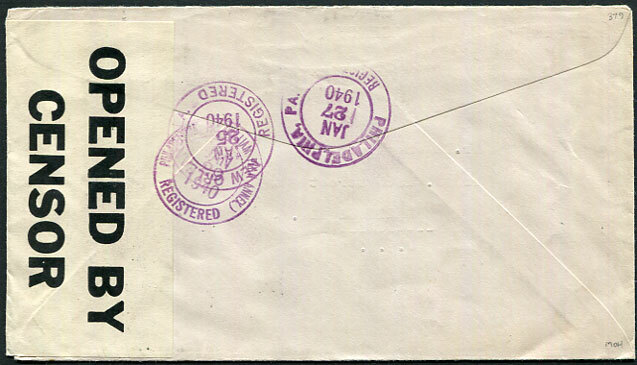 completely fabricated wrapper (1 of 2 recorded, produced circa 1950) on brown parchment paper addressed J. Lea, Nevis showing faked cancels of all markings being the PAID AT ENGLISH HARBOR Crowned Circle, ENGLISH-HARBOR JY 7 61 despatch, trace NEVIS arrival dbl-arc, only two genuine entires with this Crowned Circle (Cat.£9,000) are recorded.